Pumpkin patches, haunted houses, ghost walks, hay rides, and apple pie are all part of the fun as Fall approaches. We've found some places but would love to add to the list, so tell us if you know of any more Halloween traditions you have in Allen, Frisco, McKinney, Plano--or anywhere in Collin County. While we are continually updating this page, be sure to check our Calendar of Events for new Halloween events and fall festivals added daily which may not appear on this page, which is reserved for annual recurring events. Are you wondering if you are welcome to attend one of these events at a church if you don't share the same faith? Absolutely, you are welcome and no, the church folks won't be trying to 'convert' you or your children. These events are gifts to the community. Most events at churches are free, but some may include a small fee (when indicated on this page) to offset the cost. Does your family like to drive around and look at Christmas lights? We're collecting the best family-friendly Halloween light displays to view in October! Just follow the link to our list and if you wish to share a family-friendly, non-gruesome display with us, let us know. Just follow the link above for our guidelines. The hottest Halloween extravaganza in North Texas. Journey through the National Soccer Hall of Fame, trick-or-treat your way down the haunted Carnival Concourse filled with games, inflatables, tattoos, balloons, photo ops, live characters, yummy treats, and dance feats-oh my!. hen the night falls, strut your stuff on the main stage in our spooktacular Costume Contest. Cap off the evening with live music, entertainers, and the biggest, baddest fashion show in the metroplex. Again, this is just outside of the Collin County line, but it too cool not to mention. A Halloween camp out, haunted trail, tent trick or treating, costume and scream contests, scary movie, hayride, haunted house, campfire, s'mores and great food. This event has limited enrollment and fills quickly, so don't delay. An evening of outdoor games, nature walks, story-telling near the fire, s'mores, tent decorating contest, pumpkin painting, and be sure to bring some candy for 'tent or treating'. Limit 5 people per tent site. Meals included! Burgers and hot dogs for dinner, pancakes for breakfast. Are hauntings real? We encourage you to read our article before dabbling with the paranormal. Will you be hosting a haunted house, scare house or haunted maze? Be sure to check with your city or local government office to obtain all appropriate permits and then submit your venue to us for inclusion. On a guided 1.5-mile walk through our historic downtown, intrepid travelers encounter the mysterious, the ghostly and the darker moments of Plano's history. A woman's scream. Shades open, doors unlock, chairs unfold -- but there's no explanation. Many denizens of downtown Plano report strange occurrences in the area's historic buildings. Some claim they're haunted. Stepping out from the Interurban Railway Museum, the tour provides an exclusive peek at creepy corners, back hallways and other out-of-the-way spots downtown. This haunted house claims to be DFW's premiere haunted attraction with "sets worthy of a Broadway production" creates "a genuine theatrical experience in terror for visitors." Not recommended for kids 10 and under. You set the pace for this walk through Heritage Village at Chestnut Square and Historic Downtown McKinney Square where you'll encounter storytellers sharing the legends at each site on your map. There's a little spooky fun and refreshments awaiting your return to Chestnut Square. Discounts for children. Add the Jernigan's Swamp tour if you're over 12. Also offered are Ghostly Hauntings tours and a Paranormal experience. Yes, this is just outside of the Collin County line, but it is such a great idea, we knew you'd want to know about it! You walk the dark trail through the woods as creatures can be found just beyond the glow of your flashlight! It's a self-guided journey one mile along the shore of Lake Lewisville. Looking for something light on the ghoulish this Halloween? Visit the Interurban Museum after October 24 for the exhibit showcasing the murders, deaths, robberies and wrecks of the interurban's history. Then watch for the phantoms during a self-guided tour of Historic Downtown Plano now thru October 29. The phantoms were created by Brad Stewart and there are a total of eight along 15th St in between the DART tracks and Ave K, and one at the Interurban Museum. Enjoy candy, sweet treats, a costume contest, games, music and food trucks and fun for all ages. You have 60minutes to escape the room. There is 1hungry zombie chained to the wall. Every 5minutes a buzzer sounds & the chain is released another foot from the wall! 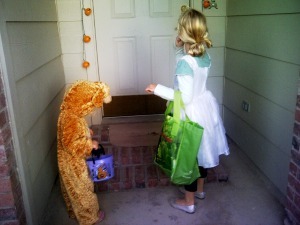 Neighborhood Trick or Treating in the Dallas area begins at sundown and lasts until about 9:00 or 9:30 pm. Little beggers stop at homes with the porch light lit, a long-time symbol that treats are ready and waiting just for the asking. Designed by families for families. Trick or Treat, live shows, haunted house. Put on your best costume for some trick or treating along our candy trail on the Square, then head back home to finish Trick or Treating in your neighborhood. Wear your costume, see the Ghost Train, and grab some candy! Offered on specified dates. Bedecked in Halloween/Fall decor with ghosts, goblins and a haunted house, visitors of all ages will enjoy the scavenger hunt that reveals many subtle and not-so-subtle features. Tots to fifth graders are invited to Trick or Treat in Frisco Fire's Safety Town. This is a fun and popular event with limited parking. Free shuttle service is available at 5828 Nancy Jane Lane, Frisco. What's more cool than Trick or Treating on Dino Trail and later walking through the Haunted Forest to Ghost Town? It's a full evening of fun including a family-friendly movie in the outdoor amphitheater and costume contest for kids 12 and under. Event sells out early! Hundreds of kiddos descend on the square, closed off to auto traffic, as the Trick or Treaters run from shop to shop seeking treats. Hayrides also available. Put on your favorite costume and come Trick or Treat at the Farmstead. Activities include trick or treating, chicken feeding, tractor rides, a craft, and so much more! Open to ages 1-9. This event for the whole family will include trick-or-treating from car trunks, costumes, door prizes, music, games and other fun! Join the community at this safe, family-friendly event. Children wear their Halloween costumes and Trick or Treat from decorated trunks, play games, enjoy music, dancing, and MORE!! A food truck will be on campus as well. All candy is individually wrapped and nut-free. Kids go Trick or Treating from booth to booth and then join in the fun events in Olde City Park. Costume contest for children and pets. One of the great benefits of living in the Buckle of the Bible Belt are all of the free Fall festivals (can you say that six times?) offered by local churches. Yup, FREE. And nope, you don't have to belong to their church or share their beliefs. Hindu? Buddhist? Jewish? Muslim? You're welcome to attend, and nope, they're not going to try to "convert" you. They want to show you they're nice neighbors. So put the kids in costume and go have fun! Admission to the festival, parking, Kid's Fun Zone, games and trick or treating are all free. Vendor shopping, a food court, live music, costume contest, a classic car show, a pumpkin carving content, and a family kickball tournament. Halloween crafts, face painting, balloon art for kids. This event does NOT include Trick or Treating at the stores. The final Fall Series Concerts by the Creek takes place from 7 - 9 pm on The Green. Come dressed in costume with your Trick or Treat bag for a fun night of carnival games and candy. For children 12 & under and their parents. The kids (tots thru fifth graders) are invited to come in costume and enjoy games, inflatables and lots & lots of candy! Enjoy bounce houses, a petting zoo, lunch, music, and TRUNK OR TREAT! Hot dogs, chips and drinks will be served. Fun for the whole family: costume contests for people and pets, games, dunkin booth and treats! In addition to the pumpkin patch and petting zoo, there will be food, live music, a car show, and rides. Lots of inflatables such as obstacle course, zipline, zorb balls, euro bungee, climbing wall, eliminator, and smaller bounce houses and slides for the younger kids too. (Wristband required) Carnival games with separate preschool area, sno-cones and popcorn. (Free). Food for purchase. Kids costume contest, pumpkin painting, catch on the field (bring your gloves! ), face painting, playground and bounce house, $1 food and beverages. Carnival rides, inflatables, a petting zoo, cakewalks, games, face painting, hayrides and more. Enjoy unlimited rides and inflatables by purchasing a wristband, or you can pay per ticket to use towards the activities. There are also plenty of free games and candy to enjoy! Food trucks will be on site for an additional cost and costumes are welcome. Join us for pumpkin decorating, pumpkin bowling and other games and crafts. Watch square dancers in the old train depot and blacksmiths at their forge. Hear the story of the Crozier house ghost read aloud on the second floor of this Victorian home. Pet adoptions. On one special day (see our calendar) the church will host a festival with bounce houses, complimentary fall photos and many children's activities. The pumpkin patch is open most days in October. A carnival theme with jump houses, petting zoo, carnival games, dunk tank, inflatables, balloon artist, candy and more. Don't miss this family-fun event! Festivities include Trunk or Treat, carnival games, a chili supper, a giant inflatable obstacle course with slide, cotton candy, popcorn, and much more! Featuring fall-fun for all ages including a vintage car show, the Youth Pumpkin Patch, food trucks, obstacle courses, fall-themed games, the Critterman, and so much more! Live music, inflatables, games, crafts, photo booths and lots of candy! Fantastic street tacos and drinks for sale. Kids Zone with bounce houses, train rides, mechanical bull riding, arts and crafts and more. ($5 unlimited play) Mutton busting ($25), hayrides, pumpkin patch, live bull riding and food vendors. Pumpkin patch, pumpkin decorating, live music, inflatables, costume contest, food trucks, shopping, outdoor movies and a chili contest! All cats receive pumpkins as enrichment, but this year with a fun Fall Festival! New and improved games and prizes, face painting and crafts, cake walk, vendors and music, silent auction of cat paints. NO costumes please. Pick your pumpkin! You will have 30 minutes to swim and pick out your favorite pumpkin. Once your time in the water is up, you will have until noon to paint your jack-o-lantern scary or sweet and take it and your very own goodie bag home. Register. Pick your Halloween pumpkin from our floating pumpkin patch! Swim and choose your pumpkin and stay to decorate it. Fall Festival is held one day (see calendar) with a bounce house, petting zoo, carnival games, face painting, story telling in the barn, cake walks, hay ride, balloon animals, hot dogs, popcorn and more! Admission, all events, and food are free. Pumpkins and Fall decorations are available to purchase daily in October (Click on link for details). The kids will have a blast running from one fun event to another: bounce house, face painting, pumpkin launching, games, and the hay ride. When you're all set to head home, choose your favorite pumpkin from the patch (purchase). Hay maze, hay ride and bounce houses are open daily; additional activities available as specified on their website. 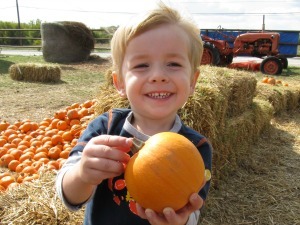 Okay, you caught us, this is technically just outside of Collin County, but since The Big Orange Pumpkin Farm (now Preston Trail Farms) is a Collin County tradition, we've included them. Admission includes feed for the petting barn, hayride, roping pen, and hay maze. Disappointing news for 2018 for fans of this event. Tucker Hill will no longer be hosting Pumpkinville as the community no longer has the Hwy 380 frontage space to set up this type of festival. 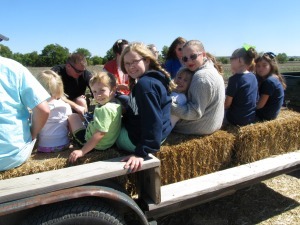 Wagon ride through an 1880's western town, hay bale maze, pony rides, petting zoo, bounce houses. (Link is Facebook Page) Every weekend take part in hay rides, pony rides, pallet maze, pumpkin painting, and entertainment. Admission is free but games and pumpkins begin at $1. While the Fall Festival is held for just one day, the patch is open late September thru Halloween. The October theme for Second Saturdays. You and your furry friends will be treated to raffles, games, "arfs" and crafts, costume contest, and more! 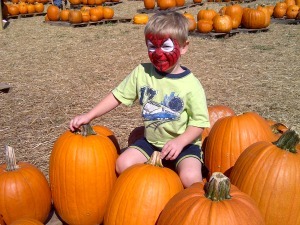 Did we miss a Fall festival, pumpkin patch, haunted house, or Trick or Treating event in Collin County? If so, please tell us about it! Send us an email and we'll get it posted as quickly as we can!